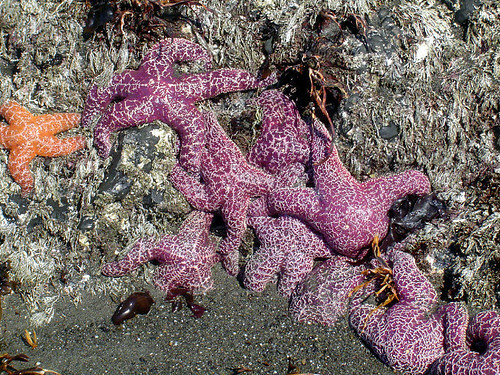 The Echinoblog: Why We Should be Concerned About a Mass Starfish Die-Off and/or Disease! Plus Updates and New Links! Why We Should be Concerned About a Mass Starfish Die-Off and/or Disease! Plus Updates and New Links! UPDATE: You can upload new pics of starfish wasting disease to this website (iNaturalist). Help track its progression! 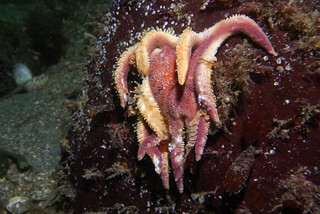 Since I originally reported on the big Pycnopodia starfish die off in British Columbia, I've gone on to invoke Starfish Wasting disease which has led to much discussion and reporting of the issue all along the west coast of North America, including concerns invoking the die off of the east coast starfish Asterias, which is closely related. Biologists from UC Santa Cruz has set up websites to monitor occurrences of mortality. 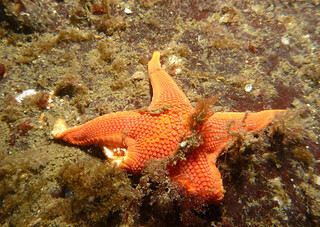 Go here (http://www.eeb.ucsc.edu/pacificrockyintertidal/data-products/sea-star-wasting/index.html) Their website has information on the history of starfish wasting disease in California and HOW to DIAGNOSE it if you see it. The number of taxa seems to be broadening but is most acutely observed in Pycnopodia. But other accounts in BC waters have been seen in Mediaster, Dermasterias, and Solaster. Other places starfish wasting disease is observed (e.g., California) it seems to be more focused on asteriids, such as Pisaster. An excellent summary of what the disease in California looks like can be found HERE. With all the media picking up the story and carrying it around to multiple outlets, at some point someone will get beyond the "weird news" twist that has been put on the articles and ask "So What?" Here are 5 reasons I think understanding why this die-off MUST be studied. 1. An Endemic Starfish Fauna. 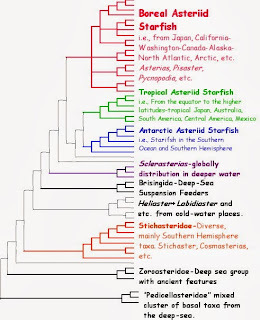 Basically, one of the important facts was that all of the asteriid starfishes in this area, including Pycnopodia (the sunflower starfish), Pisaster (the ochre star), Evasterias, Leptasterias, etc. on the Pacific coast of North America are ENDEMIC TO THE COAST. That means, you could see a starfish which resembles Pycnopodia in Australia or Mexico and it will have LESS relationship to Pycnopodia than Pycnopodia has to Pisaster! Bottom line: You won't find these starfish species anywhere else in the world. These animals are an important part of the marine ecology of the Pacific coast of North America. “They’re complicated and interesting animals,” Doc said a little defensively. What if there weren't a million of em any more? More on this below under #5-ecological impacts. These are animals which have become part of our culture. Conservation of these species is important. kind of microbe? 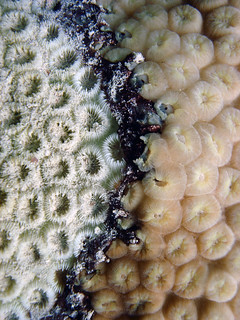 But as we see in Coral bleaching diseases, microbes are present. They might be the cause OR they might be the RESULT of some shift in their surroundings? such as temperature or overall water quality. Sea stars DO have a natural microbial fauna (here) What if that fauna/flora goes bad because of changes in some greater part of their environment? 4. Canary in a Coal Mine- Global Warming? I think the thing that always concerns me about this whole thing is whether this whole phenomena-the die offs in British Columbia, the wasting disease observations in California and elsewhere - are all tied to a particular environmental change. I have written about echinoderms as the "canary in the coal mine" animals before..but for specific environments such as Antarctica. What if something is happening and this is an early warning that we aren't picking up on? 5. Widespread Ecological Impact. Here's the million dollar issue.. What happens if diseases change abundance or remove these species from their habitats? WHAT HAPPENS? What COULD happen? The thing is, that BOTH of these species occupy important ecological positions. As mentioned earlier, Pisaster is a keystone species. The presence or absence of a keystone species in an ecosystem can dramatically change the interactions of that ecosystem. Similarly, Pycnopodia is a dominant predator of MANY other invertebrates species, sea urchins, abalone, snails, clams, etc. 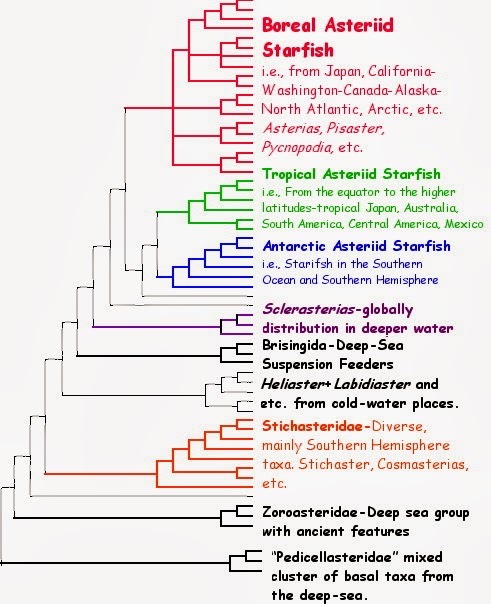 But MORE than that there could be an unpredictable cascade resulting from fluctuating populations of any of these taxa. 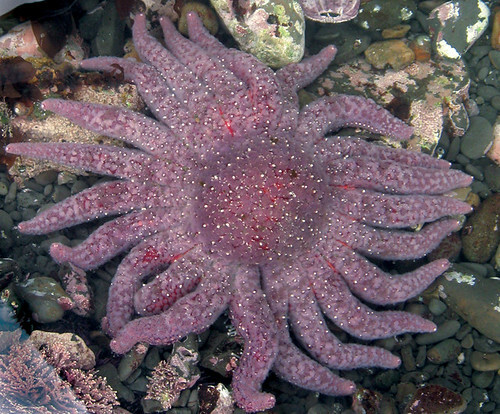 An increase in sea urchins, resulting from an absent predatory starfish, for example might result in additional sea urchin "barrens" (as I've described here). What is perhaps most concerning is how MANY starfish species seem to be affected. Many of their ecological roles are poorly understood but are likely to be important. The effect on the ecosystem is likely to be significant. Thanks to many discussions at Science Online Oceans this past weekend for discussions that inspired this post! It appears that Pisaster is starting to waste at Whytecliff Park. I went for a dive on Oct. 13th and saw many in various states of decomposition. Very worrying. Thank you for this post, and for sharing your expertise on the topic. Sadly, mass media is doing a horrible job covering this. I consider this foreboding. Of what, I couldn't say. I live in SW Alaska; any reports of the same from this area? None local has mentioned such to me, but methinks I'll ask around. Let you know if I hear anything. thanks! Please do keep an eye open! I just saw a bunch of dead/dying starfish in Elliott Bay. 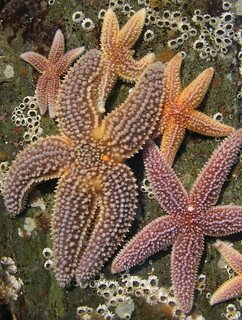 Pycnopodia and Pisaster Brevispinus. thanks! I'll pass those along..
And this has nothing to do with Fukushima. I was reading about crown of thorns sea star removal and Wikipedia mentioned a possible method of removal using an injection containing a contagious disease which caused "discoloured and necrotic skin, ulcerations, loss of body turgor, accumulation of colourless mucus on many spines especially at their tip, and loss of spines. Blisters on the dorsal integument broke through the skin surface and resulted in large, open sores that exposed the internal organs." That sounds a little like wasting disease. Could their be a connection? Indeed, the symptoms do sound familiar but that's probably because the symptoms are indicative of any starfish's body reacting to an outside agent. The stuff they are using is largely a noxious combination of sugars and salts and frankly, looks like it needs to be injected one by one. thanks for noticing! @Adam Why do they remove crown of thorns sea stars? Are they considered a pest?